Find answers to the most frequently asked questions about print. Q: What file format would you prefer? A: Our top choice would be a print-ready PDF, with a packaged InDesign file as a close second. Truthfully, we'll do our best to work with any file format that you provide — but these two options will ensure that your design is printed to the highest level of quality. For instructions on setting up print-ready files, click here. Q: How should I set up my margins for print? A: If your document doesn't have a bleed, you'll want to use margins of about 0.5" - 1". For specific instructions, check out this post. Q: How do I set up a bleed? A: A good guideline is to set up a bleed of 0.125" (or 1/8 of an inch). For specific instructions on setting up your bleed in InDesign, click here. Q: How can I send you my files? A: Depending on your file size, you have three options. 1) The order now page on our website has an upload form that allows you to send files up to 10MB in size. 2) For larger files you have the option of setting up a Conlin's Extra account. This will allow you to upload and store your files on your own private account that only you and Conlin's can access. If you already have an account, you can log in here. Otherwise, you can email us to request an account. 3) Your third option is simply to email us your file. Once again, this is best for files under 10MB. Click here to find the email address for the Conlin's location closest to you. Q: What resolution should my photos be for print? A: 300 dpi (dots per inch) is usually the minimum resolution for printing. Q: What file types are appropriate for printing? A: We can print from many file formats, including .TIFF, .EPS, .PDF, .JPG, and .PNG. Both .JPG and .PNG are raster files, which means that image data is stored at a set height and width. .TIFF, .EPS, and .PDF files are vector files, which means that they can be resized to fit anything from a small business card to a billboard. Vector file types are the best choice for large format printing, as they will minimize the amount of pixelation and distortion in your finished product. Q: How do I set up a document for printing with white, gold, or silver ink? A: Follow our easy tutorial to make sure that you set up your colors properly for printing with these specialty inks. Q: Do you have a template for _______? A: Our resource library has an ever-growing collection of print templates, design tutorials, and worksheets. To get free access, click here. Q: Do you print in CMYK or RGB? A: CMYK is the standard color mode for digital printing. Q: Why does the color on my computer screen look different from the printed color? A: The most likely reason for this is that you are using the RGB color mode. Using RGB colors in a print project can result in a discrepancy between what you see on the screen and what is displayed on the final printed piece. Q: What is the postage for my mailer? 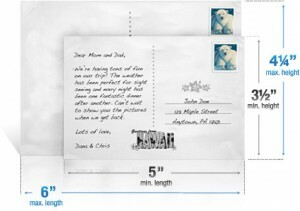 There are many factors that go into calculating postage. The chart below details the postage rates for individual pieces, but discounts are available for certain quantities as discussed in our Simple 4-Step Guide to Direct Mail. For specific pricing, give us a call at 610-337-4460. The 2019 postage rates are effective starting January 27, 2019. 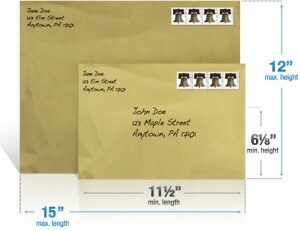 Q: What size envelope should I use? A: This decision will be determined by the price you want to pay or by the design of your campaign. 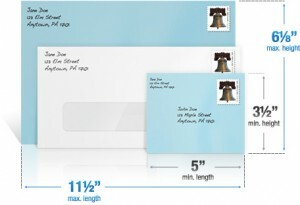 Q: What are the size categories for direct mail? A: The three categories are cards, letters, and flats. The specifications for these are outlined in the charts below. Q: Does mail still go out on holidays? A: Mail doesn't go out on holidays. Here is a list of the holidays observed by USPS. Q: What is the difference between offset and digital printing? A: Offset and digital printing are two entirely different processes. Offset printing uses etched metal plates to apply ink onto a sheet of paper. Digital printing uses electrostatic rollers (called drums) to apply toner onto the paper. Offset printing requires more setup, making it most cost effective for larger static runs, while digital printing is a better choice for smaller runs or print jobs with variable data. If you aren't sure how to choose between the two, we love to use this infographic as a reference. Q: What paper stocks do you carry? How do I choose the best stock for my project? A: Our available stocks are listed below. For guidance on choosing the best stock for your project, call or email us today. Q: What is the largest sheet size you can print on? A: On our digital press, the largest output size is 14.33" by 26". Our large format printer can print up 80" wide by any length. A: We offer a wide variety of printing and finishing services, which include bindery, digital printing, direct mail, engineering & blueprint copies, legal services, posters, banners, precision digital cutting, and cross media. Click here to learn more about the print solutions that Conlin's offers. Q: What is your normal turnaround time? A: Our turnaround time is 1-2 days after proof approval. Our King of Prussia location has extended hours until midnight and can accommodate same-day rush projects. A: You can submit a quote request using this form. One of our experts will respond within 24 hours. Need a template for your project? Join our growing community of subscribers for free access to design templates, tutorials, marketing worksheets, and more!